CHICAGO — Prosecutors on Saturday accused three activists who travelled to Chicago for a NATO summit of manufacturing Molotov cocktails in a plot to attack President Barack Obama’s campaign headquarters, Mayor Rahm Emanuel’s home and other targets. But defense lawyers shot back that Chicago police had trumped up the charges to frighten peaceful protesters away, telling the judge it was undercover officers known by the activists as “Mo” and “Gloves,” not his clients, who brought the firebombs to a South Side apartment where the men were arrested. “This is just propaganda to create a climate of fear,” Michael Duetsch said. “My clients came to peacefully protest.” On the eve of the summit, the dramatic allegations were reminiscent of previous police actions ahead of major political events, when officials moved quickly to prevent suspected plots but sometimes quietly dropped the charges later. Prosecutors said the men were self-described anarchists and told a crowded courtroom that they intended to create mayhem in Chicago. A state’s attorney cited one of three men boasting weeks earlier about the damage they would do in Chicago. 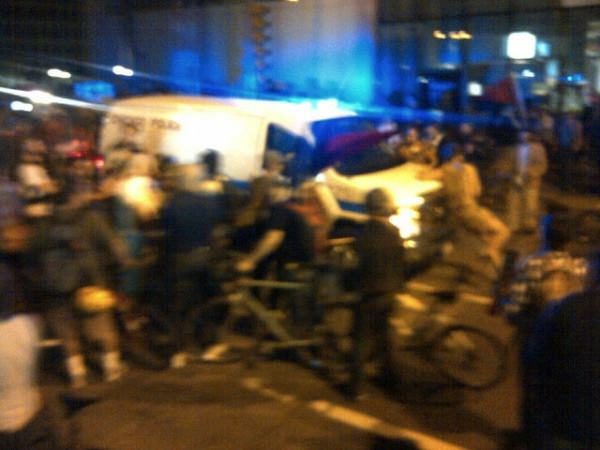 “After NATO, the city will never be the same,” he quoted the man as saying. At one point, one of the men asked the others if they had ever seen a “cop on fire.” Police Superintendent Garry McCarthy dismissed the idea there was anything more to the arrests than police responding to “an imminent threat.” “When someone was in the position (of having) Molotov cocktails — that’s pretty imminent,” he said. “It was not a completed investigation.” The suspects are Brian Church, 20, of Ft. Lauderdale, Fla.; Jared Chase, 24, of Keene, N.H.; and, Brent Vincent Betterly, 24, of Oakland Park, Fla. If convicted on all counts — conspiracy to commit terrorism, material support for terrorism and possession of explosives — the men could receive up to 85 years in prison. Later, outside the courtroom, Duetsch said the two undercover police officers or informants were also arrested during the Wednesday raid, and defense attorneys said they later lost track of the two. “We believe this is all a setup and entrapment to the highest degree,” Duetsch said. The suspects were each being held on $1.5 million bond. Six others arrested Wednesday in the raid were released Friday without being charged. They apparently came to Chicago late last month to take part in May Day protests. Relatives and acquaintances said the men were wanderers who bounced around as part of the Occupy movement and had driven together from Florida to Chicago, staying with other activists. Court records indicated no prior violent behavior. Longtime observers of police tactics say the operation seemed similar to those conducted by authorities in other cities before similarly high-profile events. For instance, prior to the Republican National Convention in 2008 in St. Paul, Minn., prosecutors charged eight activists who were organizing mass protests with committing crimes “in further of terrorism” after investigators said they recovered equipment for Molotov cocktails, slingshots with marbles and other items that could have injured police. Chicago, IL — After holding NATO protesters for up to 48 hours, and releasing 6 out of 9 arrestees without any charges, the City of Chicago filed state charges last night against 3 Occupy activists from Florida, including possession of explosives or incendiary devices, material support for terrorism, and conspiracy. On Wednesday night at approximately 11:30pm, police raided a house in the Bridgeport neighborhood, detained several people in multiple apartments, and arrested 9 activists. Police broke down doors with guns drawn and searched residences without a warrant or consent. NLG attorneys are questioning why it took the city 48 hours, the limit on holding arrestees without a court hearing, to impose such serious charges. Although some accusations of Molotov cocktails have been made by police, they have provided no evidence of criminal intent or wrongdoing on the part of the activists. On Thursday, when asked about the raid at a press conference, Police Superintendent Garry McCarthy knew so little about the alleged terrorism investigation that he said he would have to gather further information before commenting. The 3 activists charged are Jared Chase, Brent Beterly, and Brian Jacob Church. 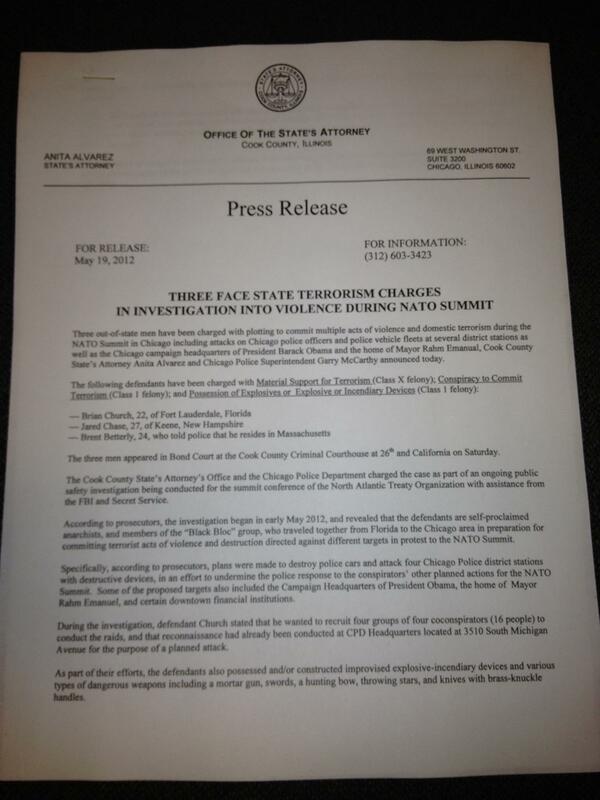 Last week, all three defendants were surrounded by several police squad cars outside of a CVS, detained for no apparent reason and asked questions about why they were in Chicago and what they planned to do during the NATO summit. One of the defendants recorded the encounter and posted an edited version on YouTube. When Superintendent McCarthy questioned the validity of the footage in the media, the entire video was quickly posted. More than 20 people have been arrested so far in the lead up to the NATO summit, which begins tomorrow. At least 3 arrestees in addition to the ones charged tonight are still in custody. “Preemptive raids meant to intimidate and stifle dissent are all too common during National Special Security Events, such as the NATO summit,” said Gelsomino. NLG attorneys will be representing the 3 defendants in their criminal cases and will be at their bond hearing tomorrow at 12pm at 2600 South California Ave. Overturned room at Bridgeport apartment raided by CPD on 5/16. Activists protesting the NATO summit were staying in the home. Home brewing equipment in Bridgeport apartment illegally raided by CPD on 5/16. Activists protesting the NATO summit were staying in the home. Broken door jamb in Bridgeport apartment illegally raided by CPD on 5/16. Activists protesting the NATO summit were staying in the home. As President Barack Obama and NATO leaders headed into Chicago this evening, demonstrators marched through the Loop for hours and sometimes scuffled with police officers. Several protesters were detained in the first serious confrontation of the day. Earliler, demonstrators spent the middle of the day outside Mayor Rahm Emanuel’s house protesting cuts in health care. Secretary of State Hillary Clinton arrived at Wrigley Field but did not sing “Take Me Out to the Ballgame.” After a night of marching, chanting and testing the patience of Chicago police in the Loop, the last remnants of anti-NATO protesters slipped away into the night. There were repeated scrums with police whenever the front of the roughly 1,000-strong crowd tried to push past police, who kept them circling in the general vicinity of the Loop for hours. Some of the clashes resulted in arrests and detentions, but Police Superintendent Garry McCarthy said there were only about half a dozen arrests. The crowd remained largely peaceful and there were no reports of major damage. Police likewise accomplished a goal of keeping protesters south of the Chicago River downtown and away from the glizty Michigan Avenue retail district, where many NATO dignitaries are staying. The last big group of protesters headed into Greektown late tonight, but eventually lost gas as police relaxed their presence accordingly. The group’s energy ebbed and flowed in the last couple hours of the march, and it “officially” dispersed at Occupy headquarters in a W. Cermak warehouse. Relations between police and protesters also went back and forth – with some noticeably warm exchanges. Other marchers maintained their anger at police with angry chants. The march dwindled as protesters walked south on Halsted Street and then east into Chinatown, until only about 75 people remained. Most of them boarded Red Line trains to head back to the city around 11:30 p.m., looking tired as they climbed the stairs to the platform. Asked how he was holding up, one protester answered simply: “Exhausted.” “I’m pretty impressed with what we did, but I’m not looking forward to waking up and doing it again tomorrow,” said the man, who gave his name only as Curran and said he was from Boston. “But when I wake up tomorrow I think I’ll feel differently.” Moments later, he and dozens of other protesters boarded a northbound train as several police officers watched from the platform, making sure the train left without incident. Among them was 73-year-old John Grobner, who’d been walking since 6 p.m. on the route that moved aimlessly yet peacefully. Grobner, from Minnesota, is here with the Catholic Worker movement to protest the war. He said his feet needed a soak but he was doing okay. “It’s a Catholic Worker thing,” he said smiling. “It’s faith and resistance.” The days of protests are leading up what is supposed to be the biggest rally of the NATO summit, tomorrow at Grant Park on the first day of the meeting for world leaders. The anti-war rally is to include a march south on Michigan Avenue to the McCormick Place convention center where the NATO meetings are being held. People should wear what they want,rather than blindly follow others.